Estrogen replacement reduces the frequency of type 2 diabetes (T2D), an effect which involves the suppression of hepatic glucose production. The objective of this study was to identify the hepatic mechanisms involved in the beneficial effects of 17β-estradiol (E2) on insulin sensitivity in mice exposed to long term (10 months) high fat diet (HFD) feeding. E2 treatment in HFD mice led to significant improvements in glycemic control. 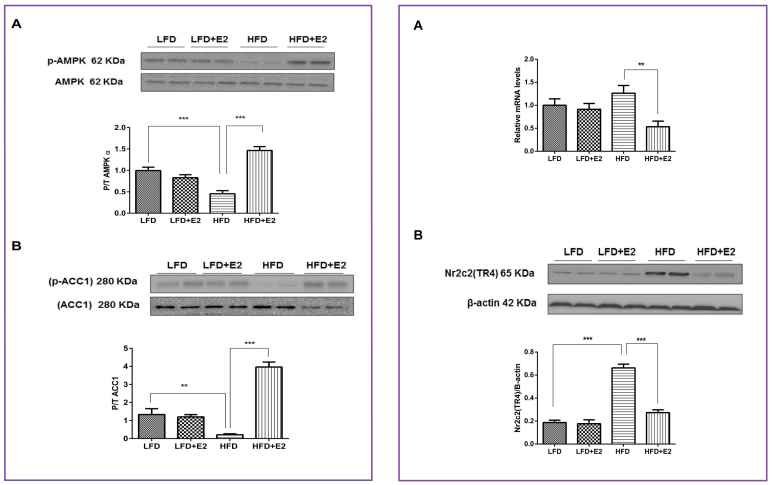 In the livers from these animals, Western blotting studies showed that E2 treatment led to significant increases in the activation state of the AMP-activated protein kinase (AMPK), in association with reduction of the nuclear receptor Nr2c2/TR4 both mRNA and protein levels, and suppression of downstream lipogenic gene expression. These effects were in parallel with up-regulation of hormone sensitive lipase (lipe) expression by E2. Increased fasting glucose levels following HFD feeding were associated with increases in the expression levels of the gluconeogenic genes, g6pt1 and pyruvate carboxylase, whilst E2 treatment significantly reduced their expression levels. The insulin signaling pathway was studied in the liver after acute insulin intervention. The phosphorylation states of AKT2 and FOXO1 were both decreased in HFD mice, and E2 treatment reversed these changes. In conclusion, E2 treatment reduced body weight and improved glycemic control in association with activation of hepatic AMPK, reduced expression of its downstream target Nr2c2/TR4, and consequent decreases in lipogenic gene expression. Together with increased triglyceride mobilization, these changes paralleled improved hepatic insulin signaling and reduced gluconeogenic gene expression.